offering illuminating examples of self-directed and child-led learning, and bringing to life the human dynamics that arise when a diverse bunch of people come together on an unconventional path. Readers will encounter social standoffs, the vagaries of email, the headiness of adolescence, and the ups and downs of life with kids. While the book depicts children learning to read and digging into math and other subjects, and addresses the age-old question of socialization, it transcends the practical aspects covered by most books about homeschooling. 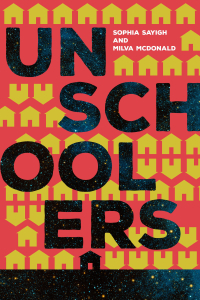 Unschoolers delivers a charming volume unique in the canon of pages about homeschooling, unschooling, self-directed learning, and alternative education. Feeling overwhelmed by the prospect of homeschooling? The sheer quantity of books, materials, and advice? The responsibility of educating your children? Sit back, relax, and absorb words from a veteran homeschooler. Milva’s book of collected writings offers encouragement, practical tips, stories from the trenches, and philosophical musings. From the title essay about the benefits of taking homeschooling slow, to getting the most out of your support group, to pondering the question of college, the short but thought-provoking selections in “Slow Homeschooling” are a great introduction to home education.